Study co-author Dr. Robert Yeh does his part for the experiment. In BMJ's quirky Christmas issue, the co-authors noted there had been no randomized clinical trial proving parachutes actually saved lives. The researchers behind the study satirically suggested using a parachute when jumping from an aircraft doesn't necessarily reduce death or major traumatic injuries compared with jumping without one. They conducted a randomized clinical trial as “evidence.” While the researchers didn't have any luck recruiting on commercial flights, they did manage to persuade some colleagues to participate. 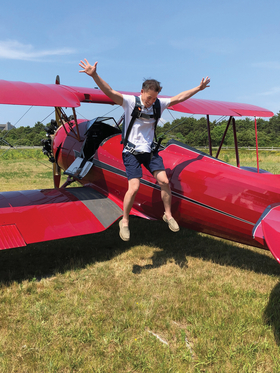 “Our study subjects jumped from either a small biplane or a helicopter, randomised to either a backpack equipped with a parachute or a look-a-like control,” according to an article accompanying the study. It should be noted the aircraft involved were all firmly parked on terra firma. The only jumping involved was a few feet off a biplane wing or helicopter doorway. The results showed parachutes didn't significantly reduce death or major injuries for anyone braving the leap. While the study has a satirical edge, it was designed to make a point about the possible pitfalls of research if subjects aren't truly randomly selected. “When strong beliefs about the standard of care exist in the community, often only low-risk patients are enrolled in a trial, which can unsalvageably bias the results, akin to jumping from an aircraft without a parachute,” they wrote. Besides their salient point, researchers also had a lot of fun with the project. “All authors suffered substantial abdominal discomfort from laughter,” they wrote.